AdBlock Plus users in Chrome and Firefox report seeing error messages instead of their inboxes. Yahoo may be hoping that access to your email is more important than freedom from advertisements. The reports, first spotted by Digiday, surfaced in the AdBlock Plus forums on Thursday. Andrei Herasimchuk, a former Yahoo designer who now works at Twitter, also claims to be blocked from his inbox. For now, Yahoo Mail’s blocking of ad blockers doesn’t appear to affect everyone, as we haven’t been able to duplicate it. 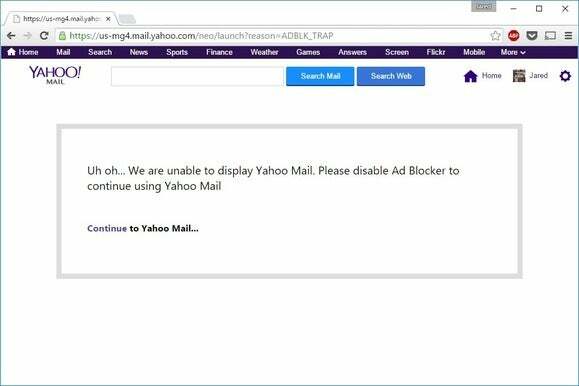 However, changing the end of the Yahoo Mail URL to “reason=ADBLK_TRAP” does bring up the error message for us, even without AdBlock Plus installed. One possible explanation, then, is that Yahoo is just testing an ad block crackdown to see how users will respond. We’ve reached out to the company for clarification. In the meantime, users may be able to circumvent the blocking by opening Yahoo Mail in a different browser, going to Settings > Viewing Mail, changing the view from “Full Featured” to “Basic,” and then re-opening Yahoo Mail in the main browser. Why this matters: Web properties have grown increasingly paranoid about ad blockers, especially now that iOS users can enable blocking in Safari. While these companies do need to pay their bills, aggressive blocking the blockers can backfire, causing users to walk away or, even worse, exposing them to malware. It’ll be interesting to see if Yahoo keeps up this experiment, or if the blowback from users causes the company to retreat.